The Greater Swiss Mountain Dog is known for it’s sensitive, faithful, and extremely loyal family companionship. This breed of dog is relaxed, laid-back, and exceptionally gentle with children, along with other pets. The Greater Swiss Mountain Dog is also known for being very watchful, forward, and cautious of its surroundings. The Greater Swiss Mountain Dog comes from a history of working roots. With this background, this breed has gained a love for the outdoors, especially in cold weather. It is important that this breed of dog gets adequate daily exercise in the form of a good walk or an energetic romp. The Great Swiss Mountain Dog can live outside in mild climate conditions, however would much prefer to be inside with its family. This particular breed of dog needs plenty of space to stretch out and relax. The Great Swiss Mountain Dog needs its coat brushed about once a week, though more often when it is in its shedding phases. This breed of dog has a life span of ten to twelve years. There are many health concerns associated with the Greater Swiss Mountain Dog. The biggest health concern for this breed is CHD. Some of the more minor health concerns that this breed of dog possesses are panosteitis, distichiasis, gastric torsion, seizures, and female urinary incontinence. It is suggested that the Greater Swiss Mountain Dog has regularly scheduled elbow, eye, and shoulder tests to track consistent health. The Greater Swiss Mountain Dog holds the reputation as the oldest and largest of four varieties of Swiss Mountain Dogs, also known as the Sennenhunde. The other three varieties include the Appenzeller, the Entlebucher, and the Bernese. Each breed shares a common heritage, most likely originating from the Mastiff or Molossian dogs of the Romans. It is said that these breeds of dogs were possibly introduced when the Romans crossed through Switzerland. However, a different theory believes that the Phoenicians brought this breed to Spain around 1100 B.C. 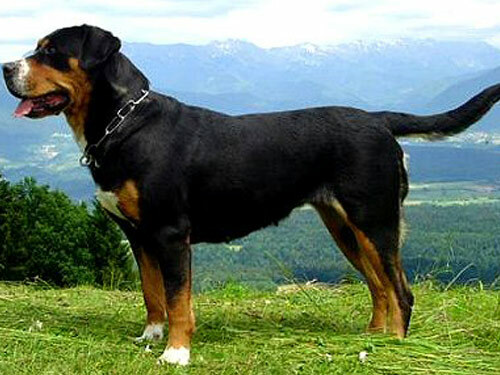 Either way, the Greater Swiss Mountain Dog spread over Europe and interbred with native dogs, which eventually caused development along independent lines in remote communities. These four varieties of Swiss Mountain Dogs generally shared the same working ethic, dividing their responsibilities between acting as a guardian of livestock and home, herder, and draft dog. All four varieties of dogs were generally assumed to be the same breed or type up until the late 1800s. However, the truth was discovered when Professor A. Heim attempted to study the Native Swiss Mountain breeds seriously. In his research, he discovered consistent differences that allowed the breeds to be categorized into four different and individual breeds. In 1908, the Greater Swiss became a known breed when Professor A. Heim identified an amazing short-haired dog entered into a Bernese Mountain Dog contest. He believed this to be a separate breed from the rest and dubbed it the Greater Swiss. After this discovery, the breed slowly grew in popularity. It was not until 1968 that the Greater Swiss came to America. In 1985, the Greater Swiss Mountain Dog was finally admitted into the AKC Miscellaneous category and achieved full recognition in 1995.